I finally arrived in Chicago after a very unfortunate flight which was diverted to another airport for several hours until a storm passed through O’Hare airport. I am only here until after my segment on “Good Day, Chicago” tomorrow morning. I’m on around 9:20 am, so tune in if you live in Chicago! I decided to make this a quick trip because I have barely been home this summer and I have been away from my family a lot. This weekend is my last hurrah before I start teaching full-time again and Mr. Picky starts school. Back to major reality. So I’m planning on some leisurely breakfasts this weekend and getting together with friends. I am also looking forward to spending some time in my kitchen again! For my last breakfast cooking class, I wanted to take the classic bacon, eggs, and potato meal and transform it into something healthier. Salad! 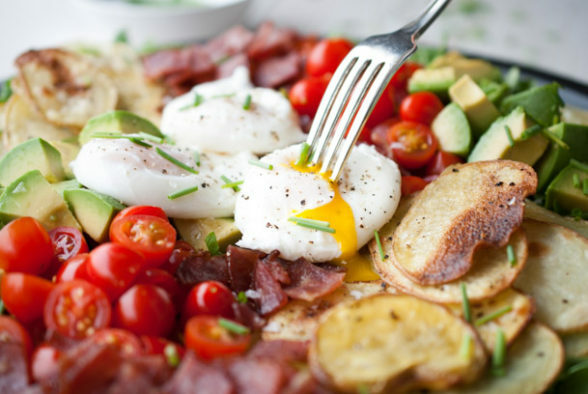 Nothing wrong with salad for breakfast, and this would make a killer brunch entree. My students loved this! This salad is so flavorful, beautiful and rich in textures. And like all salads, if there’s an ingredient you don’t want to use, don’t! Lots of people emailed me after the class and said they also made this for dinner and loved it. 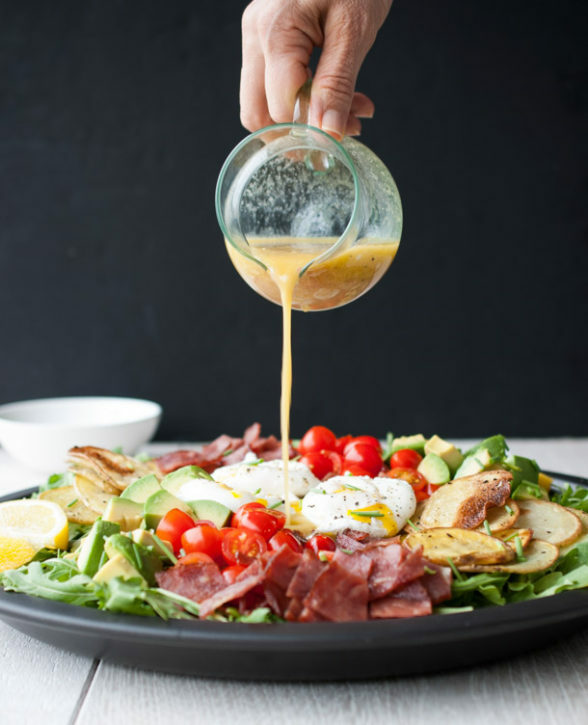 The dressing is amazing and pulls all these ingredients together beautifully. If you decide to make this for a crowd, I would opt for a hard boiled egg instead of a poached even though I have a method for oven-poaching many at one time. Ok, I’m off to get some beauty rest and dream about the fact that I wish I were eating this for breakfast tomorrow instead of the oatmeal I am going to make int my hotel room!! Preheat oven to 400 degrees. Line 2 rimmed baking sheets with unbleached parchment paper. 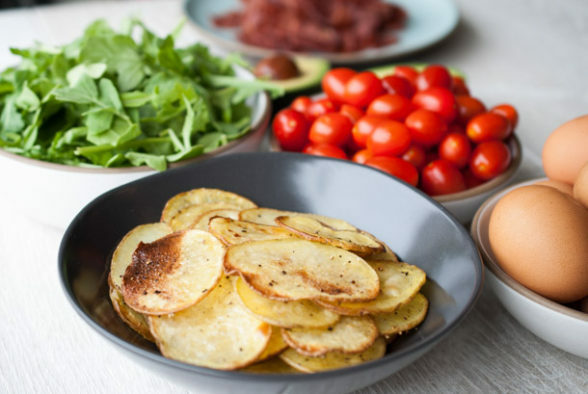 Brush one sheet with olive oil and arrange the potato slices on top in an even layer. Brush the tops of the potatoes with oil and sprinkle with salt and pepper. Cook for 30 minutes, or until tender inside and golden brown on both sides. Arrange turkey bacon slices in an even layer on the second baking sheet. Cook for 10 minutes, flip bacon over and cook for another 10 minutes or until crispy. Set both aside and allow to cool slightly. Chop bacon when cooled. To make vinaigrette, add all ingredients to a bowl or a screw-top jar. Add remaining dressing ingredients and either whisk (in the bowl) or shake (the jar) to emulsify. When you are ready to serve the salad, toss the arugula with just enough dressing to coat lightly and arrange on a platter. 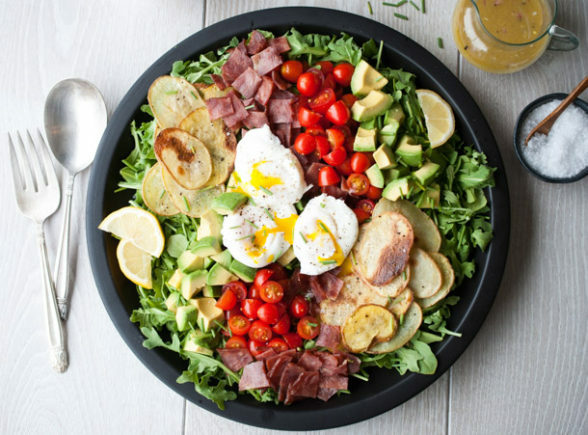 Tuck in the wedges of avocado and the slices of potatoes and top with the eggs, cherry tomatoes, and bacon. Drizzle with remaining dressing and sprinkle with herbs, if using. Fill a shallow saucepan or deep skillet with water that is 1 ½ inches deep. Bring to a boil, then lower to a simmer. Crack your eggs individually into a small bowl or ramekin. Once the water has completely settled (bubble rising to the top in a steady stream is ok), gently swirl the water in one direction, creating a vortex of sorts. Carefully pour your egg into the water one at a time, allowing the bowl to come completely in contact with the water before you release the egg. Repeat with remaining eggs if poaching more than one at a time. After the last egg has been in the water for 30 seconds, give the top of the water a gentle swirl to prevent any of the eggs from sticking to the bottom of the pan. Preheat the oven to 350 degrees. Fill each cup of a standard 12-cup muffin tin with one Tablespoon of water. Crack one egg into each cup on top of the water. Bake for 10-15 minutes, until the whites are set but the yolk is still jiggly or the doneness you prefer. During the cooking process, the water floats to the top of the egg, so it may appear as though the whites are not set after the allotted time. Use a slotted spoon to scoop the eggs out of the water and check if the whites are set, and eventually to remove the egg once whites are set. *If you are not serving your poached eggs immediately, transfer to an ice bath immediately after cooking. Eggs can be stored in an ice bath in the fridge for up to 24 hours. To reheat, transfer the eggs to simmering water until heated through. *If you don’t like poached eggs, feel free to use quartered hard-boiled eggs or fried eggs instead. Hi Pamela! 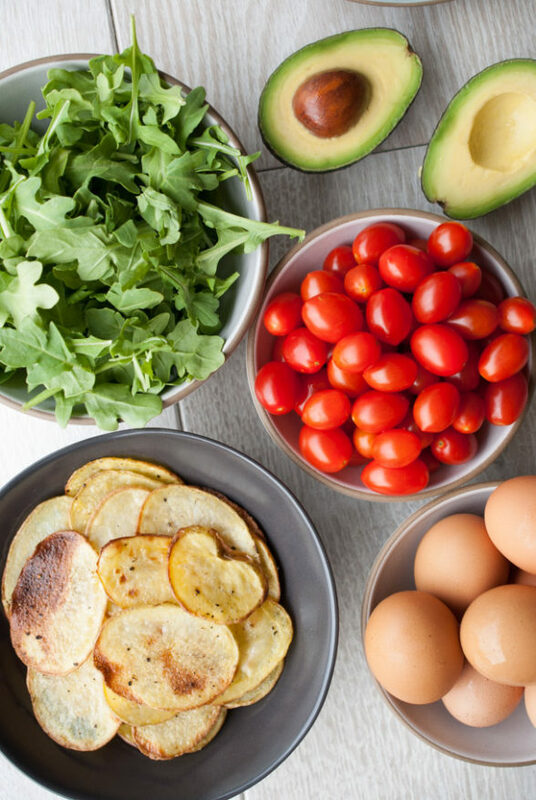 I’m going to make this for my Bible Study breakfast snack turn on Thursday… do you have any substitution ideas for the arugula? Romaine? Butter? Trying to determine if I need to make it more mild…? I would sub butter lettuce for sure! Delicious! Actually made it for dinner. Family LOVED it….my picky guy even ate the Arugula – which was a first. The different flavors and textures are super complimentary! It was perfect – only thing I’ll do next time is make more of it all!